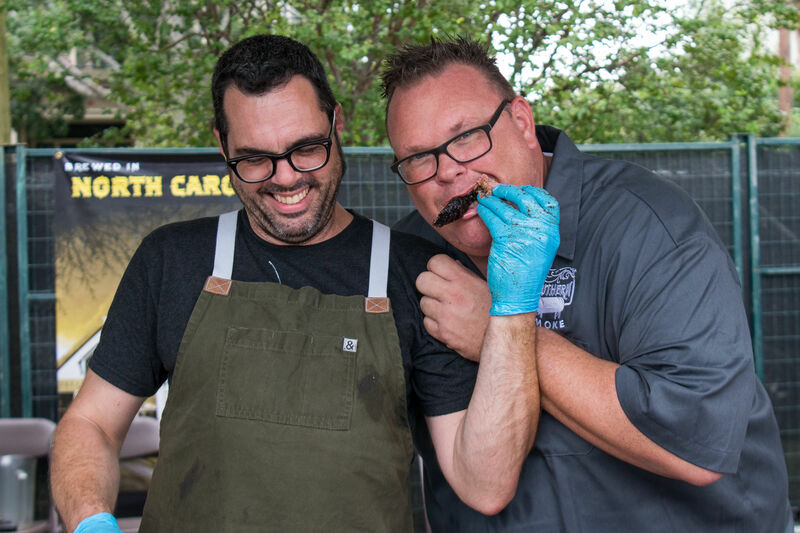 In September, between nibbles of smoked pork this and brisket that at the Southern Smoke food festival, I watched as people swarmed around Chris Shepherd, the chef/restaurateur who launched the now-annual event in 2016 as a way to give back to industry workers. He had a bit of the air of a celebrity as he chatted and posed for photographs with fans, friends, and whoever else wanted to show appreciation for his charitable efforts and revered eateries. Since I arrived here last summer, Shepherd’s name is the one I’ve heard more than anyone else’s, and what I’ve found is, his reputation is justified. Not only do his restaurants deserve all that attention, he also spreads the love. 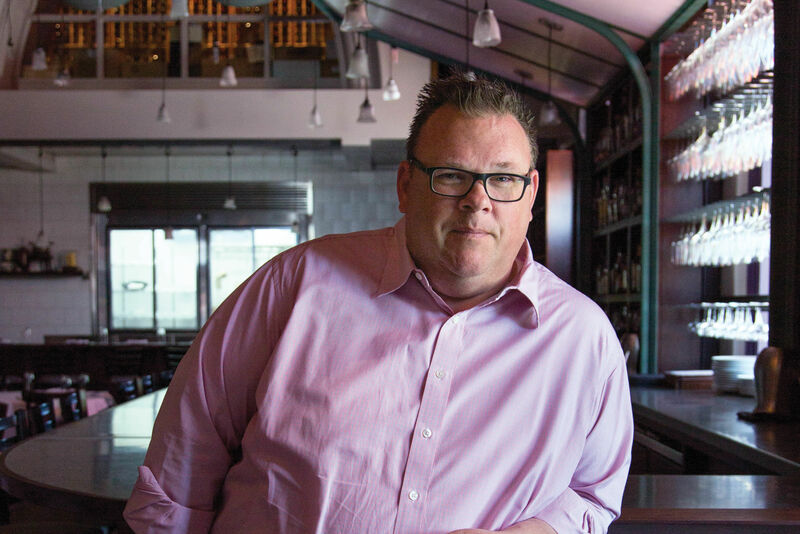 Ask anyone in town, and they’ll tell you that the Houston food scene’s now-national profile owes much to the stocky, spikey-haired man in pink button-downs and Buddy Holly glasses. 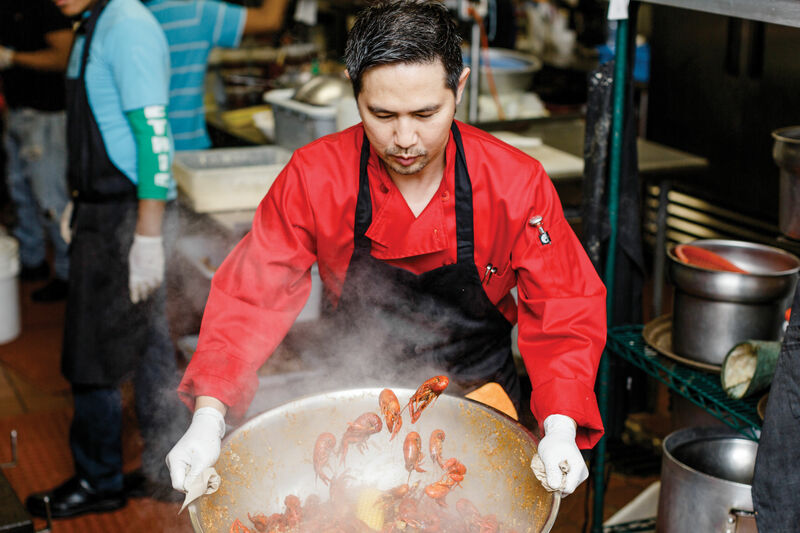 Shepherd has made a career out of sharing this city’s culinary riches with people outside, and even inside, this city—“telling the story of Houston food,” as it’s often phrased, whether at Underbelly, the restaurant that won him a James Beard Award in 2014; its successor of sorts, UB Preserv; or any of his other eateries. He’s just eminently quotable—watch the Houston episode of David Chang’s Ugly Delicious on Netflix to see for yourself. Shepherd seems to be constantly in motion. Southern Smoke—which, in its third year, raised $425,000 for Hurricane Florence relief, the National MS Society, and an emergency fund for local industry folks—took place just three weeks after the chef debuted One Fifth Mediterranean. 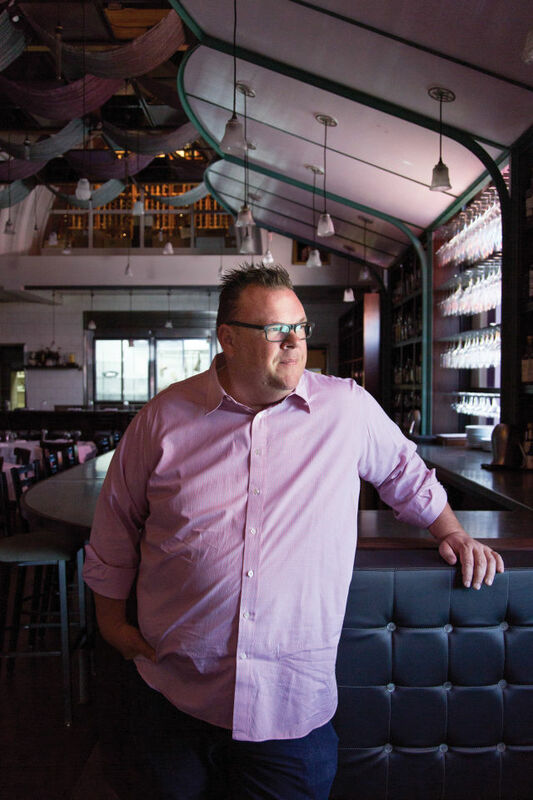 That concept, as local food lovers well know, is the third in a series that will see the chef and his team open five restaurants in the same space over five years, highlighting specific cuisines that inform the Houstonian palate (more on that soon). At Georgia James, the chef wants to create the feeling of eating at his home while offering a fine-dining experience. And he nails it. I spotted Shepherd each time I dined there. One night he probably cooked my porterhouse while playing executive chef in a Metallica T-shirt, while at other visits his role was more that of owner, patrolling the dining room in that pink button-down in between posing for more photos, chatting with customers, and zooming back to check in with the cooks. There’s always somebody celebrating something here. Wine glasses clink and laughter abounds as Shepherd’s playlist of ’70s classic rock, ’80s arena rock, and ’90s hip-hop fills the dining room. I found myself singing along to Van Halen while watching six suited men gawk at their seafood tower, and later their baller board, a meat fantasy that varies depending on the night but probably includes wagyu and dry-aged ribeye, along with other fleshy delicacies and sides. Present throughout the party is the reliable hum of a gourmet steakhouse in action. Attentive, knowledgeable servers in blue shirts and black vests expertly weave through the tables holding plates of $150 steaks and enormous pepper mills. 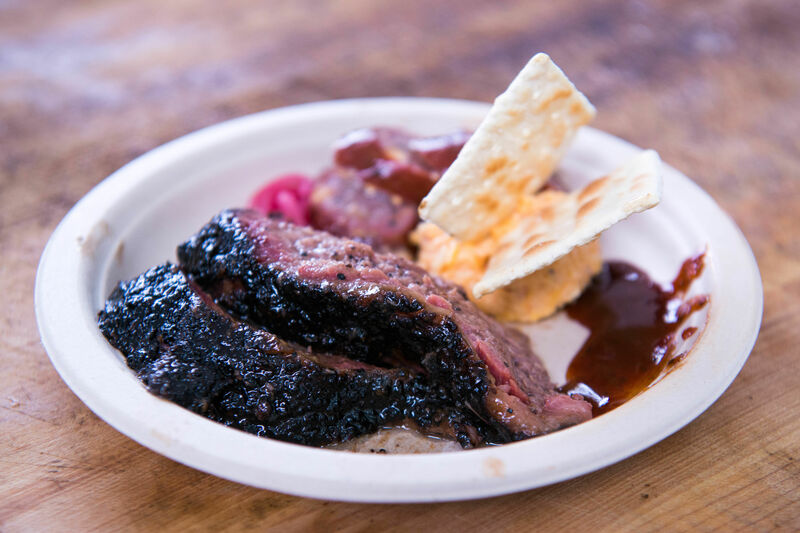 Guests are offered hot towels after being seated, then a single candle is lit—it’s made of brisket fat, which liquefies, becoming dipping oil for a crispy mound of bread. Buttery wagyu zabuton with brussels sprouts and sweet potato gratin at Georgia James. 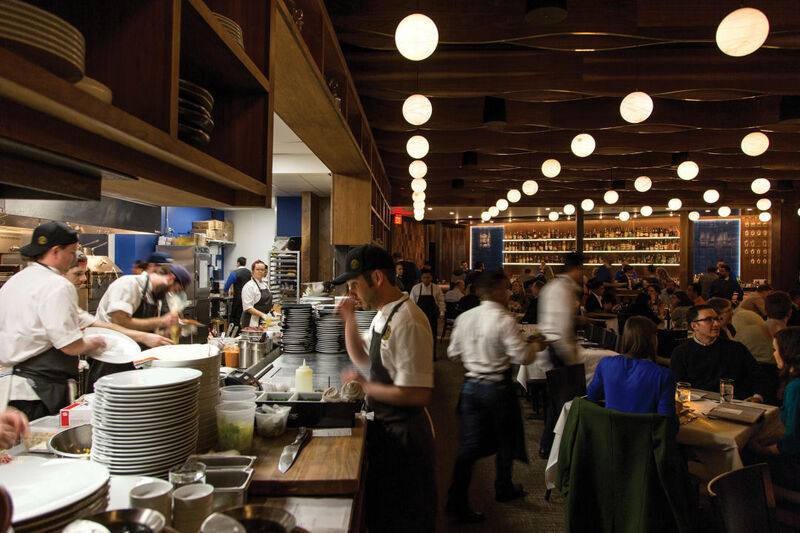 As he did at Underbelly, Shepherd cures his own meat here, in a glass-walled space in the corner of the dining room. And his charcuterie sings. I couldn’t decide which I liked more, the fatty pancetta or the beautiful coppa. Meanwhile, mouthwatering, thin-sliced ham from The Hamery in Tennessee, served with soft cheddar wedges and pickled mustard seeds, was tantalizing. I’ll be back for the starter of peppery bacon sausage with “hash browns”—gently seared potato cubes—and from the raw bar menu, the uni panna cotta, a serving of velvety-smooth uni with a Fresno chile jelly and peanuts. The only slight miss was the raw bar’s nuoc mam-marinated crab fingers, which were well-cooked but didn’t pack enough flavor. The small plates were so good, at times I forgot I was inside a steakhouse. Then I’d catch a baller board and snap back to reality. The steak menu offers a nice range of cuts. 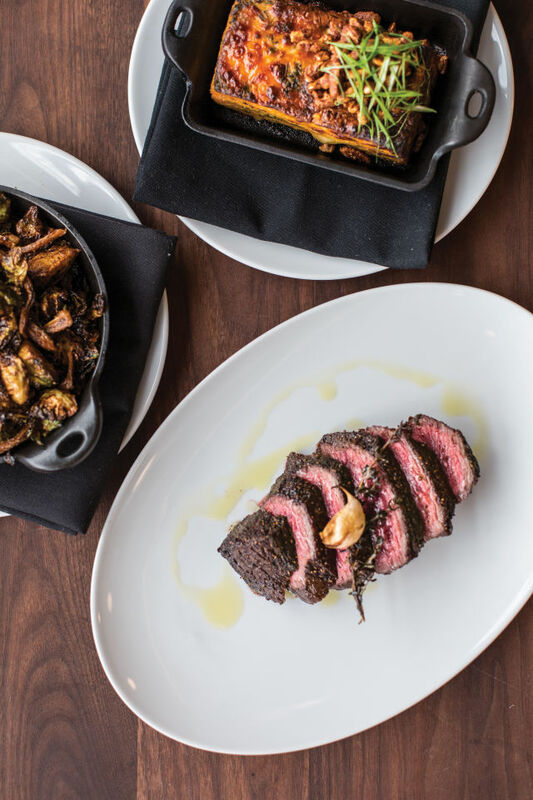 I especially enjoyed the wagyu zabuton, square-shaped pillows of rich, buttery beef, and the massive, wet-aged, peppercorn-crusted porterhouse, cooked in a cast-iron skillet to a perfect sear and excellent with the crispy, roasted brussels sprouts in bacon jam. Tasty non-steak entrées include Shepherd’s famous Tejas Heritage wood-fired chicken, barbacoa-style short ribs, and—my favorite—a perfectly flaky redfish with Gulf shrimp and a briny, acidic sauce Américaine. The drinks list, by the way, is 56 pages long. It includes a vast selection of wines from Napa Valley and Sonoma, a robust whiskey list, and excellent cocktails, especially the spicy but smooth, tequila-forward Proud Mary and the Smokie & Alice, which blends Japanese whisky with smoky scotch and citrus. That drink would pair well with any of pastry director Victoria Dearmond’s outstanding desserts, but get it with the unforgettable roasted-banana pie—an inch-thick graham-cracker crust holding oh-so-rich banana custard, a sweet banana topping, and a dollop of peanut butter cream. I could go on. There’s just so much to love here. 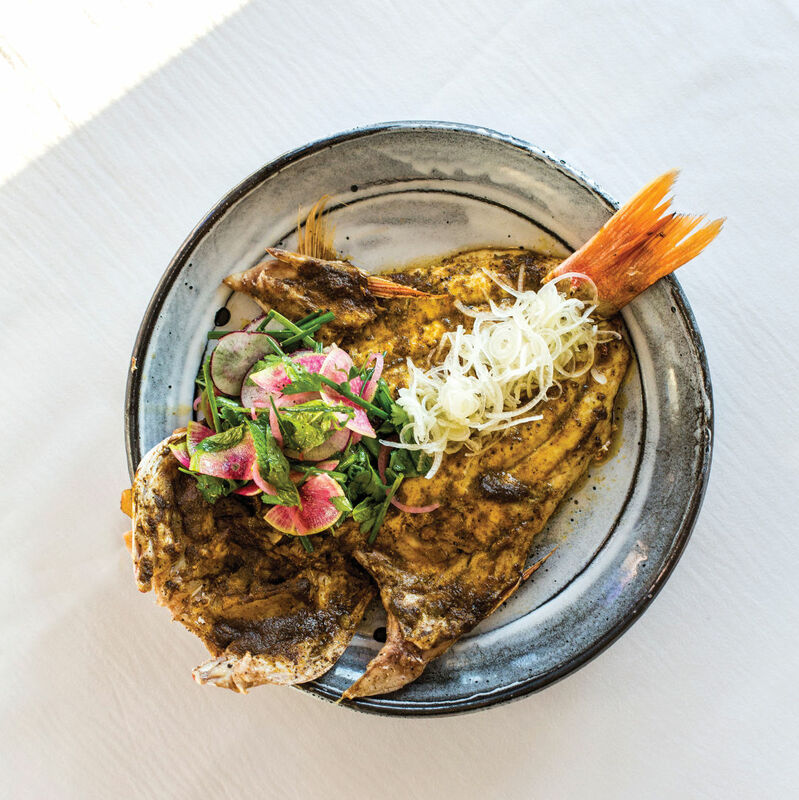 One Fifth's whole fish—in this case, snapper. While Shepherd is ever-present at Georgia James, I didn’t spot him once over several visits at One Fifth Mediterranean. That makes sense, though. Yes, the menu got a complete makeover after One Fifth Romance Languages closed, and he changed some of the interior of the former church—including swapping the draperies that hung from the ceiling for blue-and-white tiles—but many of the faces are the same. Matt Staph continues his role as chef de cuisine, while general manager Jeff Buhrer remains a fine stand-in for Shepherd. Buhrer seems to visit every table and bar seat throughout the night, even if it’s just to make a passing comment: “Liked the laffa, huh?” The team makes it look effortless. Oh, and the laffa, a pita-like bread that comes with the yogurt-marinated chicken, is wonderful. You can’t go wrong with anything coming from the kitchen at this concept, which features the cuisines of countries including Israel, Lebanon, Turkey, and Yemen; a soundtrack of ’80s and ’90s pop; and lots of Greek wine, whiskey, and ouzo and its cousin arak, a traditional Turkish spirit. If you can get everyone at the table to agree on it, $60 per person will get you a sampling of items from all sections of the menu. A fine option for first-timers, it starts with Shepherd's warm, fluffy, slightly sweet pita, cooked in a traditional Arabic taboon, which goes with everything, especially the fire-roasted red-pepper-and-feta dip muhamara, the smooth and smoky eggplant-and-sumac dip mutabal, and the traditional hummus. 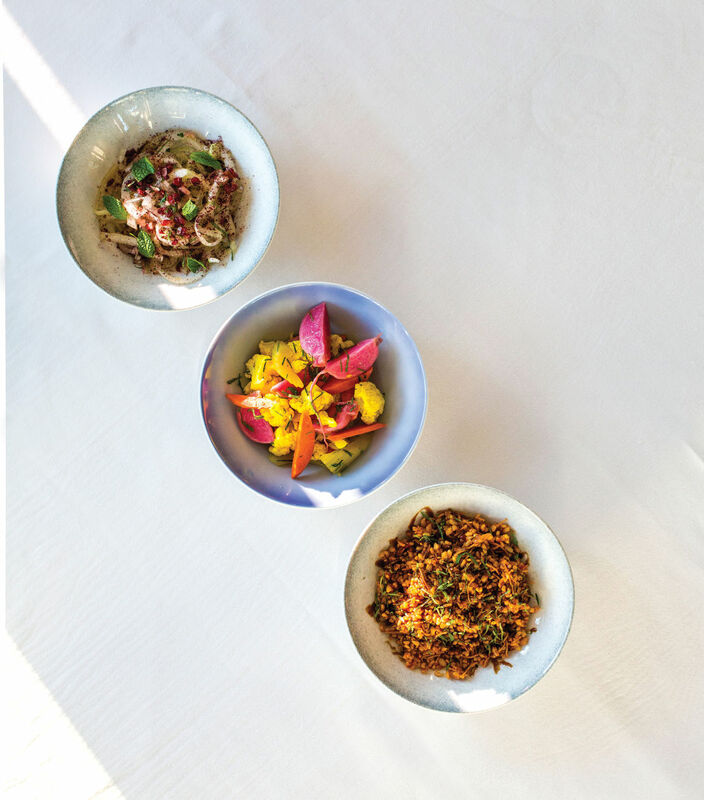 From top left: barberry-onion salad, torshi, and itch at One Fifth. The menu offers a selection of Israeli-style salads. You can order either three or all five, and your server will leave them on your table through the entrée course. I most enjoyed the sweet, tart barberry-onion dish; the pickled-cauliflower-and-carrot delight known as torshi; and the earthy, spicy bulgur-and-vermicelli creation called itch. You could easily make a meal of the small plates on the mezze section. I’d always spring for the kibbeh naya, a traditional Lebanese lamb tartare that goes perfectly with the crusty, beautifully charred Yemeni fried bread called malawach and the velvety Lebanese garlic sauce toum. And the kataifi-wrapped haloumi—phyllo-wrapped cheese in a spiced apple and pear sauce—is a masterpiece. The al ha’esh portion of the menu—which translates to “on the fire,” indicating taboon-cooked items—includes dishes like a sweet-glazed 44 Farms flat-iron steak and soft eggplant topped with feta and tehina, but the standout is the lamb sweetbreads. Don’t be put off by eating pancreas: These tender morsels, topped with a thick date syrup, dried peanuts, and spices, are delicious. During one visit the server told me and my dining partner that the family-style dishes weren’t suitable for us unless we were very hungry. Well, we were, and honestly, the whole fish—in this case, a light, moist, filleted, broiled snapper—was a good size for two diners. Get it with a side of tah dig, crunchy rice topped with yogurt, chopped pistachios, and pomegranate. And please, save room for dessert. Once again, Dearmond offers a roster of treats, including a super-sweet sesame halva custard brightened by pickled cherries and crunchy pistachios, and a chocolate babka that, while slightly dry, finely balances sweet and bitter flavors and comes with a rich, malty chocolate ice cream. One Fifth Mediterranean already feels like a longtime friend, so it’s a shame it’ll go away after July to make room for the spot’s fourth theme. But, hey, it’s safe to say that whatever concept goes in will be wonderful, too. And lucky for us, Georgia James is here to stay.